Boise-based grocery giant Albertsons is set to merge with Rite Aid and again become a publicly-traded company. The transaction brings together the companies which Bob Miller has spent most of his career building. Miller started with Albertsons as a store manager and served in a variety of roles until making it to EVP of of Retail. Later, he guided RIte AId as both CEO and executive chairman. Now, if a deal is approved, Albertsons and Rite Aidwill become one company. The merger would bring together the assets owned by Rite Aid which aren’t being acquired by Walgreens-Boots Alliance – 1,932 stores in all as well as all of the stores owned by Albertsons under one roof. Headquarters will be in both Boise, Idaho and Rite Aid’s HQ of Camp Hill, PA. The news release terms this as “co-headquarters.” How this plays out on a long-term basis will be an open question for Treasure Valley leaders and workers. Rite Aid CEO John Standley will be CEO, while Bob Miller will be Chairman. Where Standley will be based isn’t known. When Albertsons merged with Safeway, co-headquarters were also announced in both Boise and Pleasanton, CA. Over time operations were moved to Boise and the company solidified its official HQ in the Treasure Valley. Rite Aid will pick four seats on the board, Albertsons will pick four seats and one seat will be jointly selected – giving this a carefully set structure to make the companies “equal” in the new entity. Albertsons shareholders (led by Cerberus Capital) will own 70% of the new entity. The companies will go public. 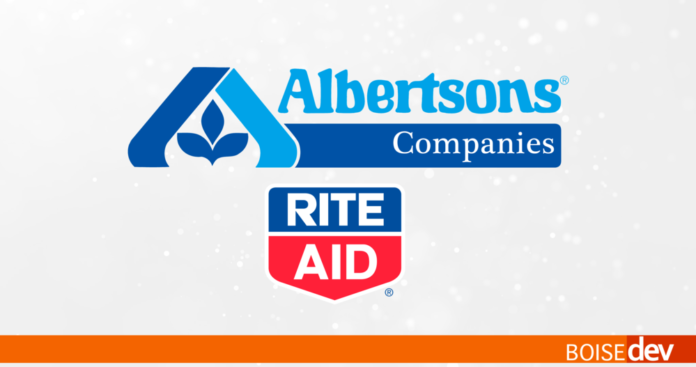 Rite Aid is currently a publicly traded company while Albertsons is the nation’s fourth-largest private company. It has been working to go public for several years but has not been able to accomplish that goal. The combined company name has not yet been hammered out, according to the news release. In-store pharmacies owned by Albertsons will be rebranded as Rite Aid. Standalone Rite Aid locations will also continue. In the Boise area, Rite Aid has nine pharmacy locations, while Albertsons has almost 20 (with more on the way). Market overlap could be an issue for federal anti-trust regulators as it was in the original Walgreens/Rite Aid proposal. The company could be made to divest some locations or pharmacy lists in markets where together they would have outsized market control. With CVS entering the market, it could be an opportunity for that chain (or others) to acquire standalone pharmacy locations. Locations like the Rite Aid and Albertsons that are directly across from each other at 17th and State could be tricky. With the upcoming Market Street Idaho concept, the new company will operate three brands in the market (Albertsons, Rite Aid and Market Street). Store-branded product lines from both chains will be cross-polinated – O Organics items at Rite Aid for instance, and Daylogic at Albertsons. A merging of loyalty programs – your phone number could earn gas and other rewards at both chains.